5354 ∆ 4 5 Pfg. 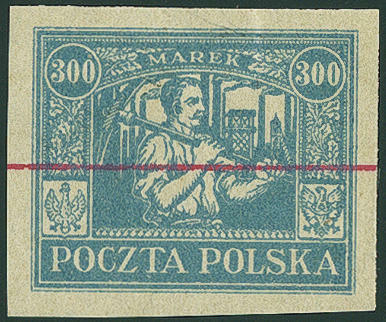 Germania with blue hand stamp \"C. I. H. S. \", so-called \"Oppeln provisional issue\", fresh colors and very well perforated on very nice white on piece in outstanding quality, all perfect used \"Opole 19.2.20. \". Photo expertize \"genuine and immaculate\" Gruber BPP. 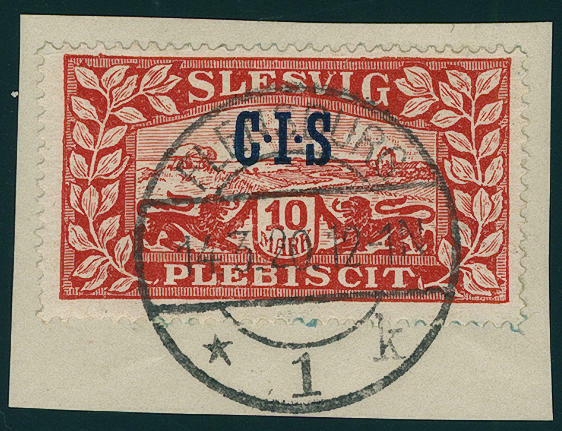 5358 ∆ Jan 14 Postage stamps set 1920 with overprint \"CIS\", all 14 values wonderful fresh colors on lovely white letter pieces, in each case single perfect used \"FLENSBURG 14.3.20. \". An outstanding set of this rare issue for the highest standards! Photo expertize \"genuine and IN perfect quality\" Gruber BPP. 5355 ✉ 13 5 Mk. Green with additional franking on commercially used insured letter over 12000,- Mk. 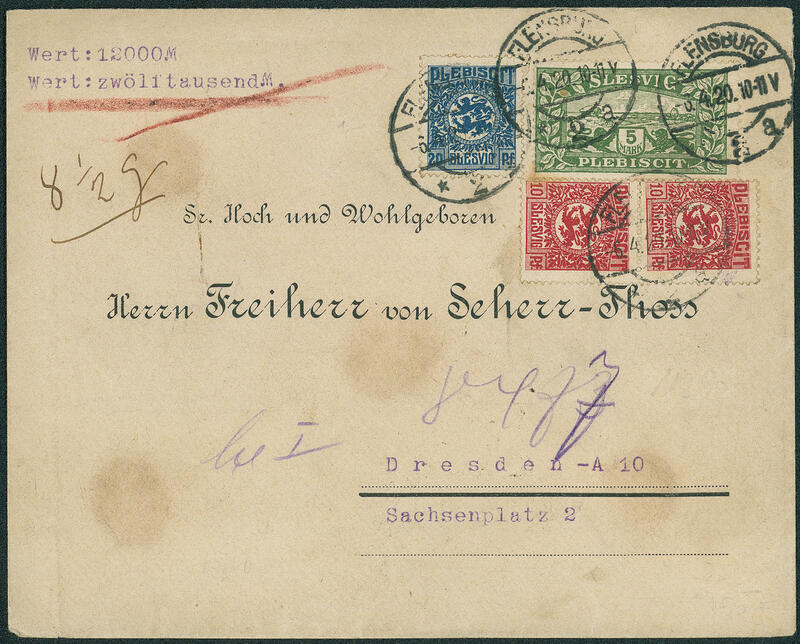 From \"FLENSBURG 6.4.20\" to Dresden with arrival postmark. In this kind extraordinarily rare! 5357 ✉ 15a 1 Ã¸re blackish olive gray, 20 pieces as correctly franked mass multiple franking on gef. Printed matter, at the bottom file punching, from \"NORRE SMEDEBI 17.7.20. \" to Flensburg. Very rare! 5353 ✉ 1 5 Pfg. 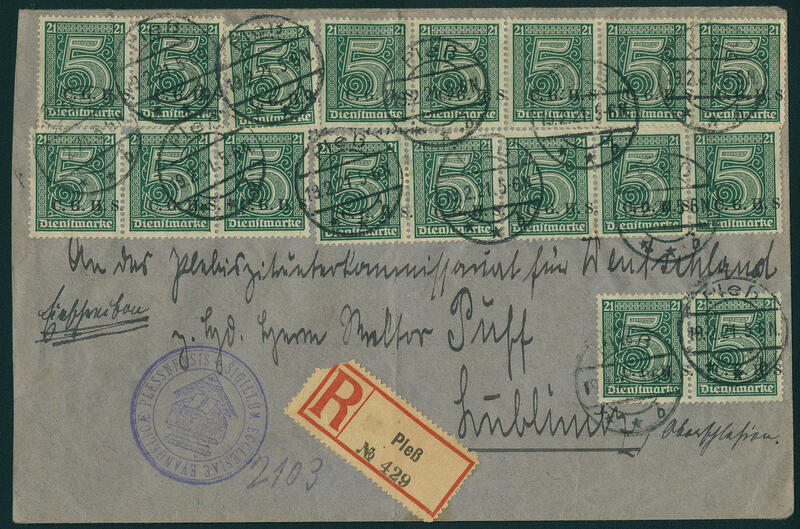 Blackish green, official stamp, spectacular mass multiple franking from 18 copies on correctly franked used registered cover, three values faults, from \"PLEß 19.2.21. 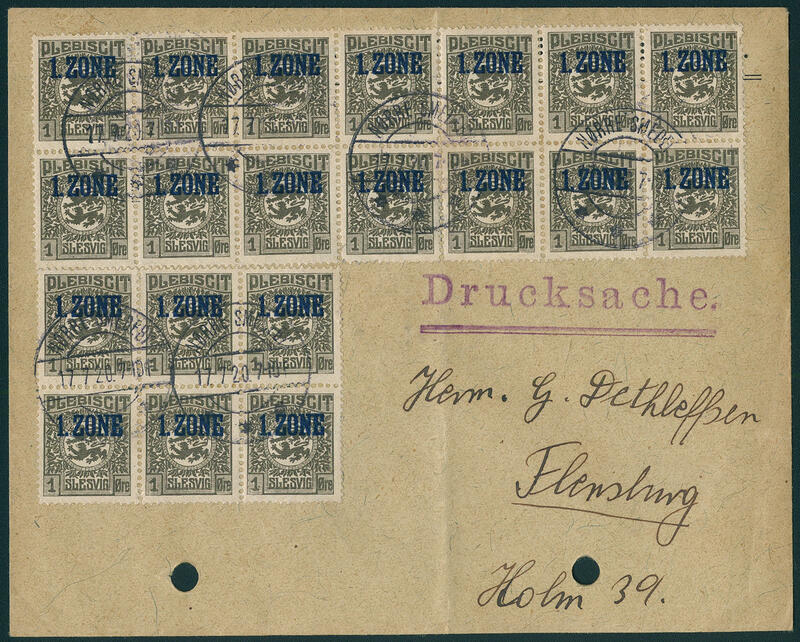 \" to Lublinitz with arrival postmark. A spectacular franking rarity this of this area, utterly commercially used and in this kind of prime rarity! 5352 17/20P Postage stamps set 1923, all fours values as unperforated trial proofs with red invalidation line, fresh colors and in perfect condition on ungummed paper, very rare, expertized Petriuk BPP. Michel 1200,- €. 5383 ∆ 79 3 Mk. 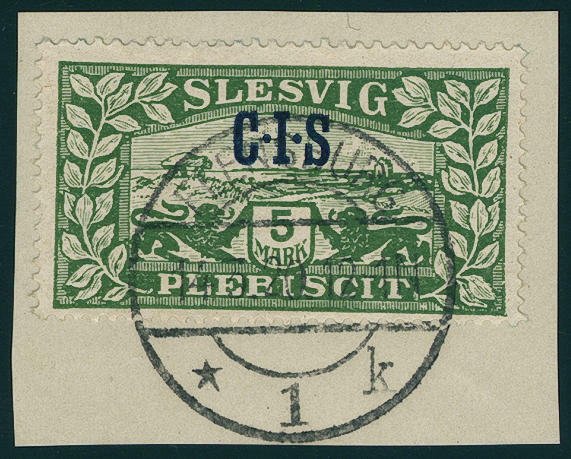 On 60 C. Airmail, wonderful fresh colors and very well perforated on beautiful white letter piece, centric cancellation \"STONISCHKEN 23.9.22. \". An especially nice copy of this rare and sought-after issue! Photo certificates \"genuine and immaculate\" Prof. Dr. Klein BPP, Huylmans BPP. 5384 ✉ 79 3 Mk. 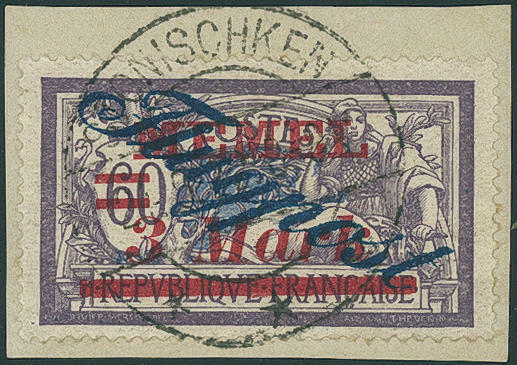 On 60 C. Airmail with additional franking 5 Mk., in perfect condition on very nice, correct franked registered air mail letter from \"Memel 10.7.22. 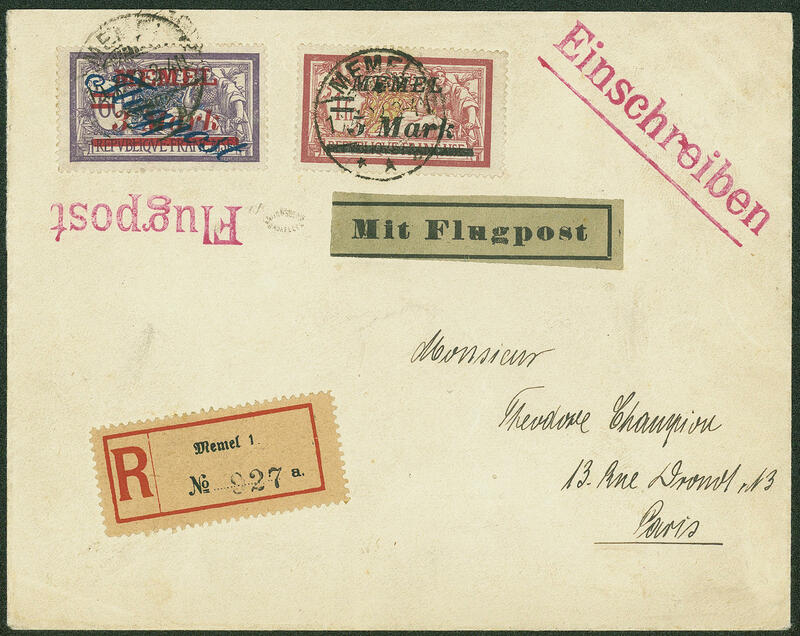 \" to Paris with transit cancellation \"BERLIN 2 C airmail 12.7.22. \". 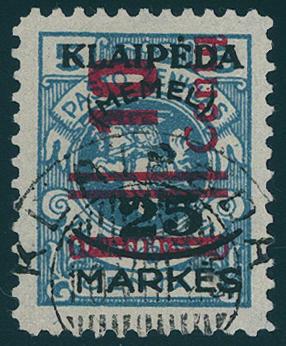 Genuine used air mail letters with the 3 Mk. 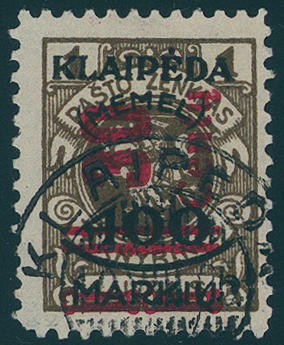 Are very rare and to class among the sought-after rarities the Memel philately! Photo certificates Prof. Dr. Klein BPP and Huylmans BPP. 5385 79III 3 Mk. 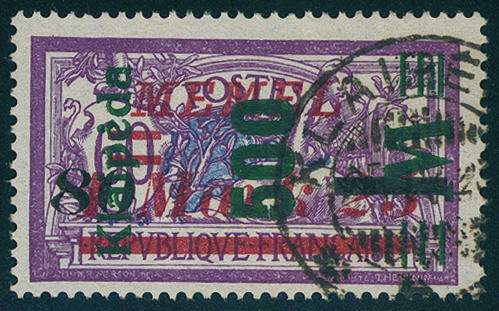 On 60 C. Airmail with very scarce overprint error \"G IN airmail top right spiky leaking\", fresh colors and very well perforated, in perfect condition mint never hinged there are only few examples from this known! Photo expertize \"genuine and immaculate\" Huylmans BPP. 5386 ⊙ 164/66III Postage stamps set 1923, uniform with overprint error \"gap between MARK and 25 3, 8 in lieu of 4, 3 mm\" fresh colors and neat cancelled in perfect condition. As complete set virtually never offered! Expertized Dr. Klein BPP. 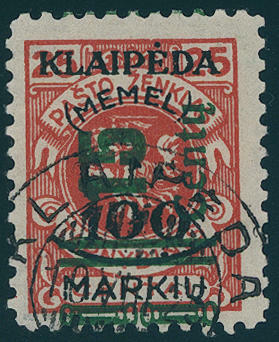 5387 190 15 C. On 25 Mk. Bright reddish orange, fresh colors and in perfect condition mint never hinged, photo expertize Erdwien BPP. Michel 950,- €. 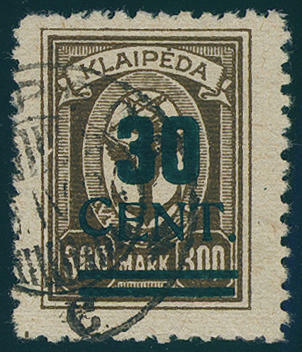 5388 ⊙ 230/33I Postage stamps set 1923, all fours values fresh colors and in perfect condition with perfect mounted first day cancel \"KLAIPEDA 10. VIII. 25. \", herewith the key value still with good overprint error \"strong broken ornament bar\", which only on field 93 occurs. 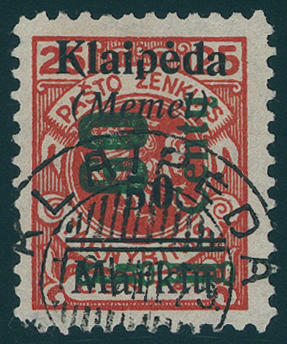 An anyway genuine used very scarce set, associated with the good overprint error and the first day cancel a seeming unique set! Expertized Dr. Petersen BPP. Photo expertize Dr. Klein BPP. Michel without valuation of the first day cancel already 2200,- €. 5389 ⊙ 236Ia 30 C. On 500 Mk. 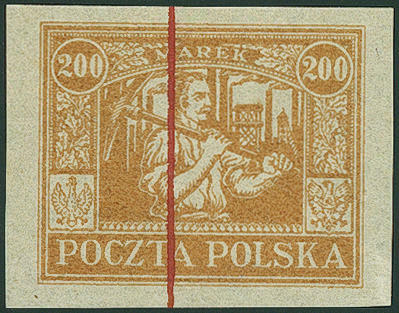 Dark ochre brown with very scarce overprint error \"C from cent higher standing\", which only on field 98 occurs. 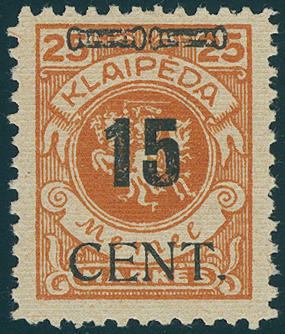 The stamp is wonderful fresh colors and on self-formed pages \"KLAIPEDA\", a tiny nearly invisible corner crease is insignificant. There are very few genuine used examples of this variety have become known! Photo expertize Huylmans BPP. Michel 3800,- €. 5390 ✉ 237I 60 C. On 500 M. Orange green overprint with high quality additional franking (Michel no. 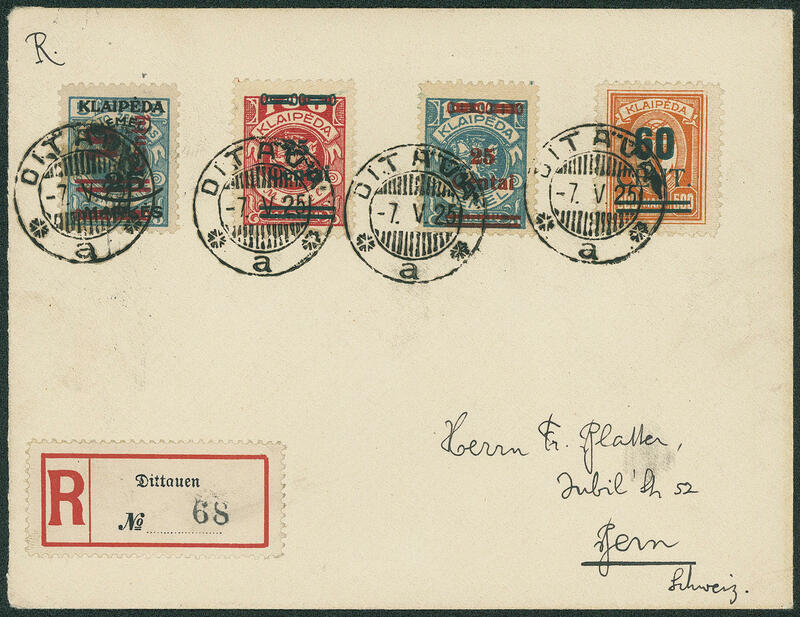 219 I, 221 I, 230 I), in perfect condition on very nice correctly franked registered cover from \"DITAVA 7. 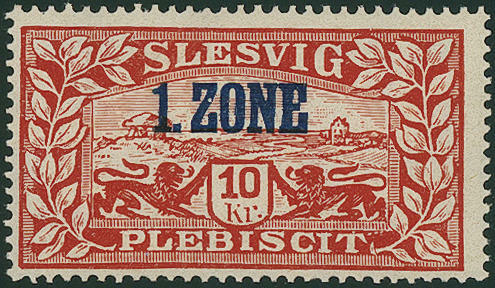 V. 25. 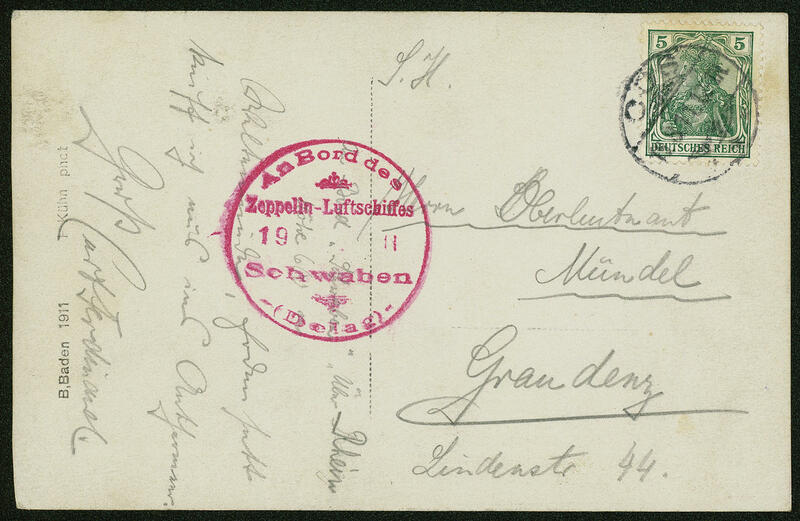 \" to Bern / Switzerland with arrival postmark. There are only a few letters of this rare issue have become known. 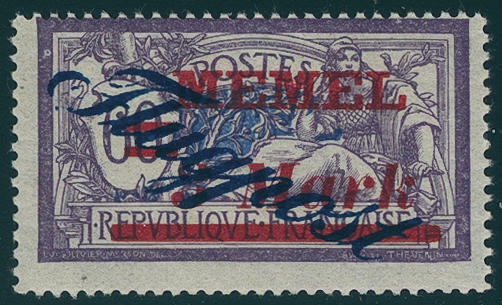 A Memel rarity! Photo expertize \"perfect quality\" Dr. Petersen BPP. 5012 ✉ 2II Airship Swabia, 5 Pfg. Germania on very nice Zeppelin postcard from \"OOS 19.8.11. 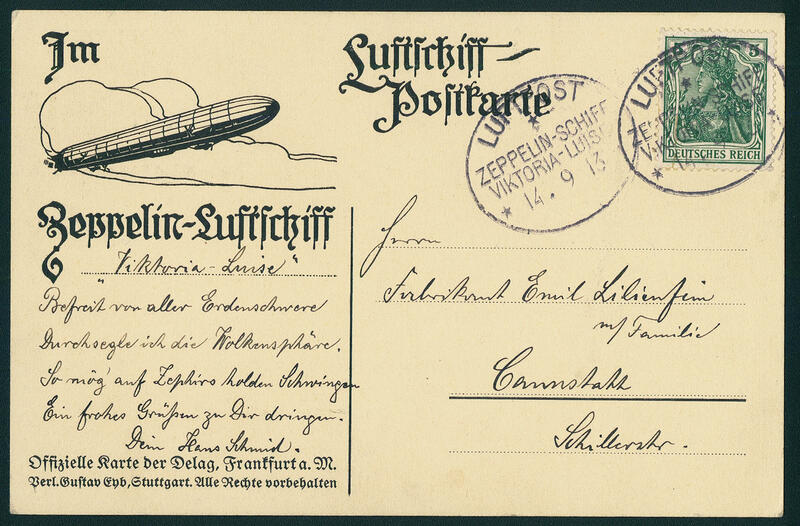 \" with additional red on board cancellation mark \"aboard of the Zeppelin air ship Swabia (DELAG) 19.8.11. \" to Graudenz. A particularly beautiful and scarce postcard the Pioneer Zeppelin mail! 5013 ✉ 4 Viktoria Louisa, very nice Zeppelin postcard with 5 Pfg. 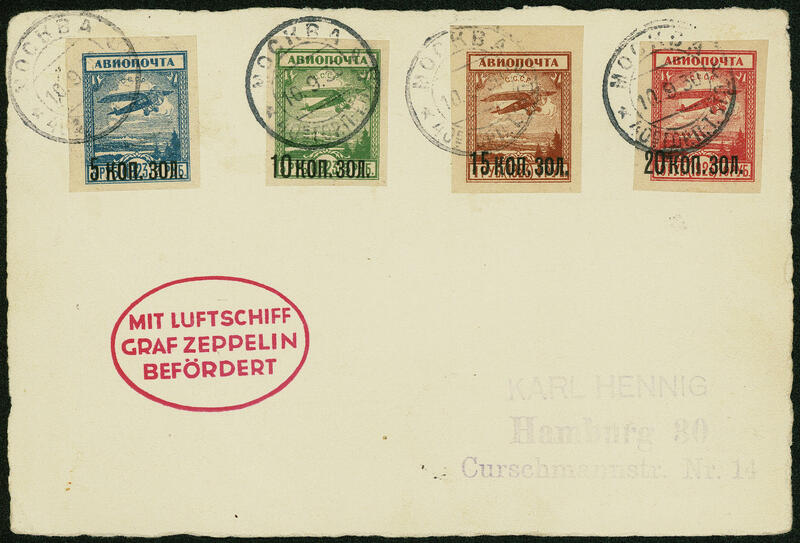 Germania and double mounted on board cancellation mark \"airmail Zeppelin-ship VIKTORIA Louisa 14.9.13\" on officially card of the Delag Frankfurt with illustration \"view on BADEN-BADEN, benefactor investment\" to Cannstatt in outstanding condition. A very nice pioneer flight card! 5014 ✉ 4a Viktoria Louisa 1913, transfer trip Hamburg-Frankfurt, Delag card \"in the Thunderstorm storm\" with 5 Pfg. 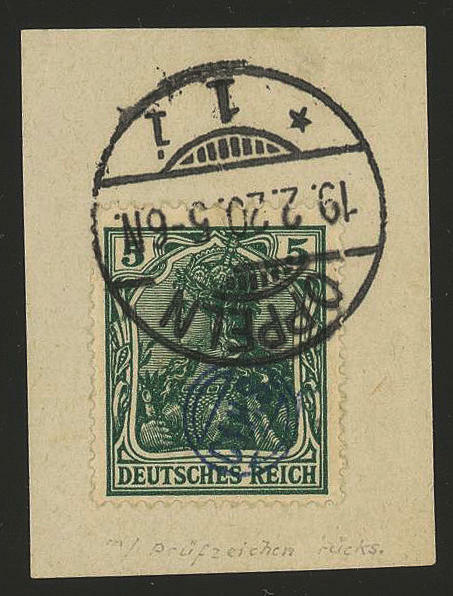 Germania and stamp \"GÖTTINGEN 16.7.12. \" to Wilhelmshaven. 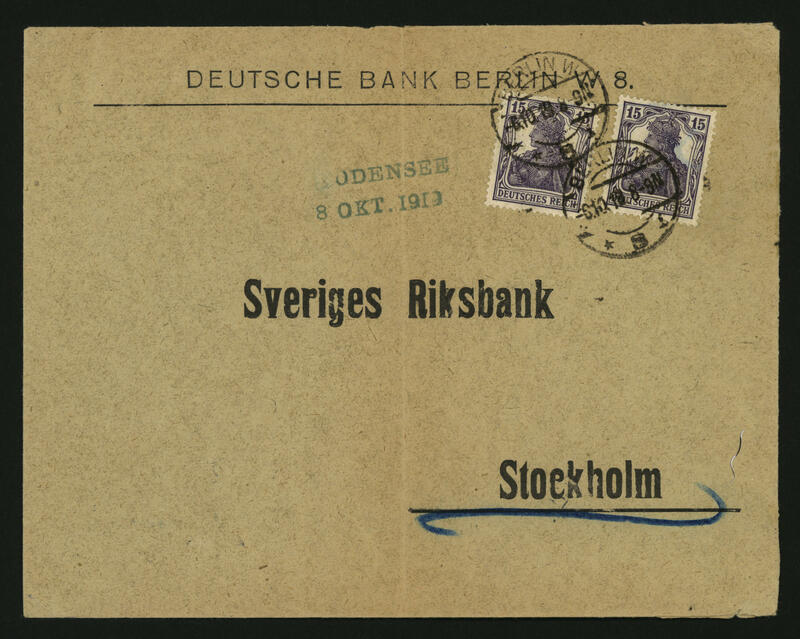 5015 ✉ 19K Special excursion to Stockholm 1919, 15 Pfg. 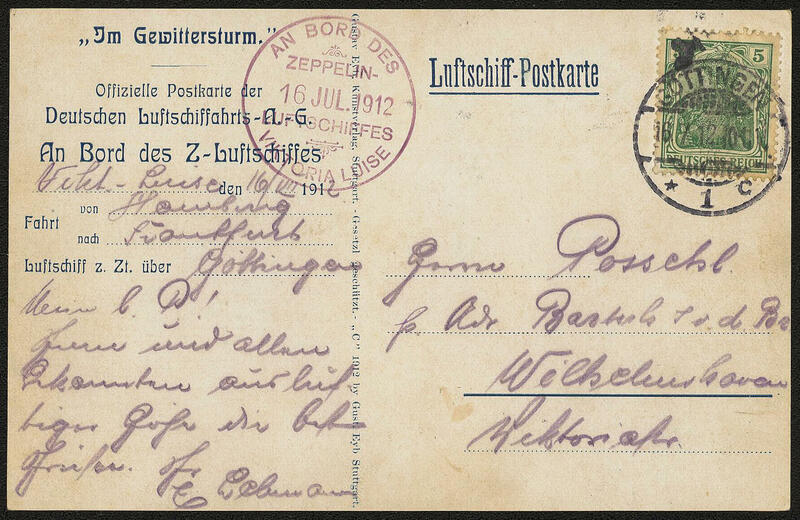 Germania (2) with neat postmark \"BERLIN 6.10.19\" and additional airmail confirmation stamp \"Lake Constance eighth of October 1919\" on faultless commercial letter of the German bank Berlin to the Swedish Reichsbank in Stockholm with arrival postmark. Large Zeppelin rarity! 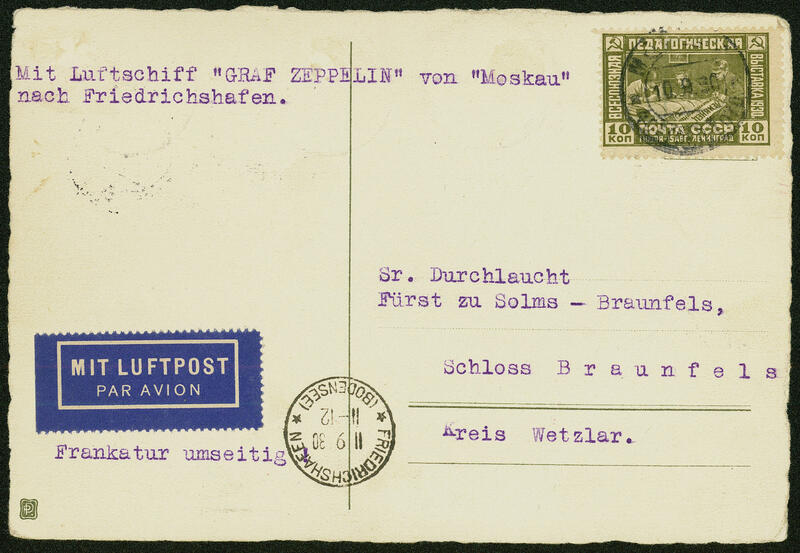 5016 ✉ 85E Return flight from Russia 1930, very nice Zeppelin postcard the return flight, without special stamp, front- and franked on reverse. A significant Zeppelin rarity, there only 20 cards were transported!